If you’re a soccer fan you may have heard the expression “professional foul”. This is when a player deliberately breaks the rules to interrupt the run of play. For example an opponent may be heading to score in an open goal and a defender sees their only chance of stopping it to be by tripping the would-be scorer up. He knows he’ll give away a free kick for it, and probably pick up a yellow card too, but, on balance, it’s a better option than conceding a definite goal. Well poker has its own version of the professional foul and it comes in many forms. The activity of carrying any of them out is called angle shooting and chances are you’ll come across it sometime in your playing career. But, unlike the professional foul in soccer that is very definitely in contravention of the rules, the activities covered by angle shooting are not specifically forbidden but they definitely are frowned upon by all players who come up against them. Although not as seriously disapproved of as slow rolling, any attempts at angle shooting are likely to make you few friends at the table. 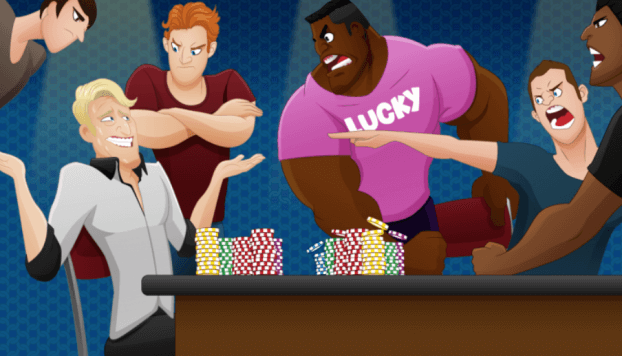 It’s a problem that’s more evident in the live game than in online poker as it mainly relies on ambiguity of intention when playing which is designed to unsettle or wrong-foot opponents and there are far fewer opportunities to do this in the online environment. Here are just some of the main forms of angle shooting that you might encounter. Watch out for opponents who you think may be giving out ambiguous gestures or making statements whose meanings aren’t very clear. These are both techniques which aim to deceive you into revealing information or, more cunningly, to make you think that you can exploit the person who is pulling the stunt. These take a number of forms which may include the angle shooter making a gesture that looks like a check with the aim of seeing what you will do in response. They will then insist that they were not checking and use the new information that they have gained to work themselves into a more advantageous position. It may also involve making an indistinct statement like “you got it” or “I’m beat” while also showing the typical body language of a player who’s about to fold. Their ultimate aim is to coerce you into mucking your hand after which they will argue they were asking if you’ve got a winning hand or saying that they’re feeling tired. So if you ever find yourself in this kind of situation it will always pay to ask them directly exactly what they mean by the statement that they’ve just uttered. To accomplish this the player might move their cards gently forward to give the impression that they want to fold. Again, they usually use the body language to suggest that they’re opting out of the game and they may even say something non-committal and which is open to interpretation. Their aim is for you to muck your hand and, if you do, all of a sudden they will perk up and swear that they never meant to give the impression that they were folding. Another similar technique is to gather a stack of chips in front of them to make it look like they’re about to call. They don’t move them quite as far as the bet line but do put down their cards face up. Once again, they hope you’re going to muck your hand and when you do they will claim that they had called. Because they’ve shown their hand but you’ve mucked yours they would win, however good your cards might be. So always ensure that when your opponent folds (or says they are going to fold) that they really do. Never give up your hand until the dealer has collected your opponent’s cards and is pushing you the pot. This can happen in a number of ways but it always has the same aim – to trick information out of you. The offending player will bet or check when it’s not their turn to see how you’ll respond and then take the appropriate action. So, for example, if you’re the first to act and your opponent doesn’t want to call they could bet when it’s not their turn in the hope that you’ll check to them and let them do the betting. But then, when checked to they will check behind. This is such an effective trick that you’ll find it being used perhaps more than any other form of angle shooting. So if you ever come across an experienced player doing this you’ll know it’s not just because of beginner’s confusion and that you’re being played. Many consider this to be one of the most deceitful forms of angle shooting of all and if you ever experience it then it’s time to find another table to play at. Let’s take an example where players have to put in 50 chips to call. The angle shooter isn’t confident that he or she will win but they seem to put in the chips nevertheless. You show your cards and seem to have won but the angle shooter then reveals that they’ve only put in 40 chips so their bet hasn’t been completed. But if, on the other hand, they do win it’s pretty unlikely that they’ll bring their short stake to anyone’s attention! There are many more forms of angle shooting out there but we’ve concentrated on the ones that you’re most likely to come across in your play. And don’t think they’re confined to the amateur game, it’s also rife in some of the biggest tournaments and on TV poker shows too. So if you want to play fair and stick within the etiquette of the game make sure you’re never the one caught angle shooting and, whenever you think another player may be guilty make sure to let the dealer know.